High carbon knife steel blades; 8 point snap off; fits all standard 18 mm, heavy duty snap-off knives. No. 11-300: fits No.10-150 and most other 3-1/2", 9mm snap-off blade knives. 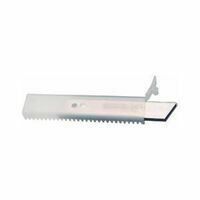 No 11-301: fits Nos.10-218, 10-480, 10-380, 10-280, 10-220, 10-418, 10-151 and most other 4-1/2", 18mm snap-off blade knives. Five 9mm blades, used as replacements for most knives requiring 9mm blades and Hyde Nos.42030, 42047, and 42055; 13 points per blade. Replacement blades for the heavy duty Stanley 25mm snap off knife 10-425 (228.6136). Fits most 25mm snap-off blade knives; 25mm blade. 7-point snap off design. Rock hard cutter blades. Comes in 10-pack dispenser. For cutting and scoring. Can cut 160-feet of drywall and stay sharp.